I haven't read this in French. The edition I refer to is that published by Penguin in 1963. This novel does not appear to have been published in hardback in Britain prior to 1963. The title is in the form of a weak pun. A stone wall does in fact figure in the plot, but the secondary meaning, of being unable to make progress because of a strong defence, barely seems to apply, and puts the title on a par with A Face for a Clue which Steve has already noted as having little relevance to that book. 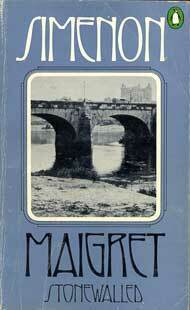 It is surely unusual for a Maigret story to be so precisely dated. Does this happen in any other story? Incidentally, the dating of Le Chien jaune to 1930 in an earlier posting would mean that Maigret had been transferred to the Flying Squad of Rennes soon after the conclusion of the case of Monsieur Gallet, décédé. There is a fine evocation of the heat of early summer and the soulless surroundings in which Monsieur Gallet lived, in an unfinished housing development some 20 miles out of Paris. I seem to recall a similar unfinished suburban development in one of Simenon's early romans durs, Les Fiancailles de Monsieur Hire, and of course there is the Michoux's half-finished speculation in Le Chien jaune. Simenon associates such places with unsatisfactory, incomplete lives. No doubt he was also reflecting the realities of social change in the inter-war years. This sets the tone for Mme Gallet, whose family believes she has married beneath her, to a mere commercial traveller. There is of course a huge irony in this, in that she has actually married a member of the Royalist aristocracy to which her father devoted his life. But she will remain unaware of this, accepted back into her family as a result of the money accruing from her late husband's insurance policy. Money and family seem to be the two main and interlinked themes of the novel. Maigret of course is more or less oblivious to both, responding with sarcasm to comments about family pride and with indifference to a bribe offered by the real Emile Gallet. "Are you investigating the murderer or the victim?" the young man said slowly. Money, love, pride: you can find all these "devouring passions" in Maigret Stonewalled, and in many other Maigrets besides. 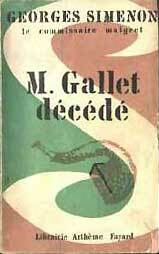 As Roddy said, the date in Monsieur Gallet décédé is very precise, but not totally accurate: Later on in the book, in chapter IX "un mariage pour rire" [A Fake Marriage], Maigret thinks about the date: "Supposons que nous soyons le samedi 25 juin ...." [Suppose it's Saturday, June 25...] In 1930, the 25th June was a Wednesday. Simenon took some freedom with the calendar. Il savait qu'à la base de cette mentalité on finit toujours par trouver une passion quelconque. Et c'est précisement ce qu'il cherchait dans le visage à barbiche, aux paipières plombées, à la bouche démesurée. [Maigret] knew that at the bottom of this mentality [of crooks, criminals and swindlers] there was always some driving passion. And that was exactly what he was searching for in the bearded faced, with its drooping eyelids and enormous mouth. 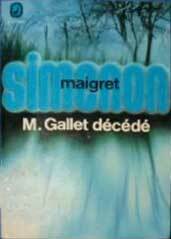 Maigret is trying to understand the victim, his life: to become himself like the victim. In the Simenon interview, Simenon told an anecdote about his daughter and the way he behaved when he wrote a book: being physically affected by the characters. This book is also the first encounter with someone we will see in many other Maigrets, all along his career: Joseph Moers who appears in chapter 6! Assouline asserts that "Jews are often associated with financial manipulation, like Jacob, the blackmailer, in Monsieur Gallet, décédé... " (Assouline, p30). However, this is simply wrong: Monsieur Jacob (which is a nickname based on his appearance, and who may not even be Jewish) is only a go-between who makes a tiny amount of money out of sending and receiving the real blackmailers' letters. It is true that Simenon is aware of a casual anti-Semitism, as in Chapter 7 when Maigret asks the notary in Sancerre if he knows a Monsieur Jacob. The notary's reply is: "Good Heavens, no! It must be a Jew!" I think Simenon here is playing on received ideas. ...Simenon has vehemently denied any antisemitic intentions in such portraits, adducing to his defense other works, like Le Petit Homme d'Arkhangelsk, in which Jews are treated with sympathy, understanding and admiration. The most reasonable conclusion is that Simenon (a) thoughtlessly wrote some anti-Semitic pieces in his youth; (b) retained unconsciously for a time some anti-Semitic vestiges from his culture, which cropped up marginally in his work; and (c) was rid of all such vestiges at some indeterminate point in his maturity. As Jerome has said, in this chapter we have the first appearance of Joseph Moers, of the laboratories of the Criminal Records Office, who was to appear in many later Maigret novels. 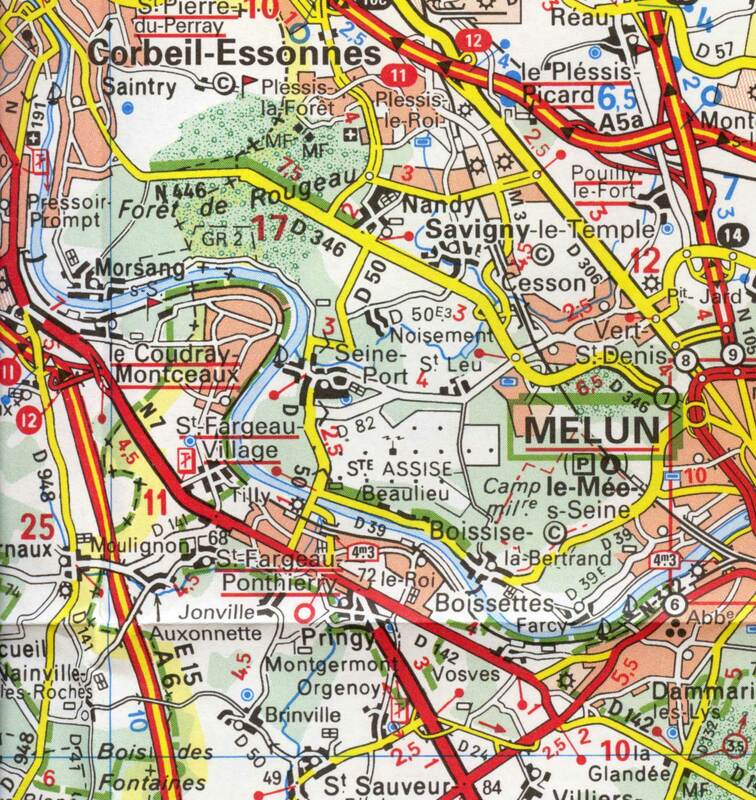 Moers was the name of Simenon's great-grandfather on his mother's side; it was also the surname of a fellow reporter on the Gazette de Liège. However, Assouline seems not to have noticed that the manager of L'Hotel de la Loire in Monsieur Gallet, décédé, is also called Monsieur Tardivon. I wonder if the name occurs in other books? In this context, Marnham states: "The Marquis had a steward, Pierre Tardivon, who impressed Simenon so much that he later made him the model for the father of Maigret" (Marnham, p111). Bresler describes Tardivon as "a burly, no-nonsense countryman" (Bresler, p49), while Eskin says he was "a tall, lanky, rough-hewn man who strode competently about the estate in boots and a velvet jacket" (Eskin, p52). By the time I reached Chapter 5 I realised that there had been no mention so far of Madame Maigret. If I'm not mistaken, she does not appear until Chapter 11, when Maigret returns home at the end of the case. This cavalier treatment of a fine woman -- no phone calls, no postcards from Sancerre -- indicates perhaps that Simenon had not yet fully decided on Mme Maigret's place in her husband's life and in the books, and he rectifies this in later books. It is characteristic of her that her first question to her husband is: "Have you had something to eat?" "You look as though you have just come from a funeral!" remarked Madame Maigret, when he got home to his flat in Boulevard Richard-Lenoir.... "Have you had something to eat?" "I have," he said to himself, looking round, happy to be back in the familiar surroundings. "From the moment he was buried..." He added, though she couldn't have understood, "However, I would rather deal with a real genuine corpse, killed by a proper murderer...."
In my posting on Maigret Stonewalled Chapter 6 I said that Moers was the name of a reporter on the Gazette de Liège. This now seems incorrect to me, but there is some confusion. Assouline refers to Henri Moers as Simenon's "friend and colleague at La Meuse" (p35). Eskin calls him "a fellow reporter on the Meuse" (p41). 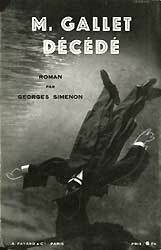 As far as I know, Simenon never worked for the Meuse, which was a rival of the Gazette de Liège. I think we can take it that Moers was indeed a "fellow reporter", but that he worked for a different newspaper. What is significant is that he was a friend of Simenon's who collaborated with him on an unfinished detective story, a parody of the Sherlock Holmes type, called Le Bouton de col (Marnham p72), and more importantly it was Moers who introduced Simenon to La Caque, which in turn provided the genesis of the early Maigret novel, Le Pendu de Saint-Pholien. Binet-Valmer contributed frequently to Paris-Centre, a newspaper owned and run by the Marquis de Tracy, to whose employ Simenon moved on the recommendation of Binet-Valmer. Paris-Centre (which Bresler refers to as Le Courier du Centre, published in Nevers) was a right-wing newspaper, with Royalist leanings. In Monsieur Gallet, décédé, Aurore Gallet, the wife of Emile, is the daughter of the late editor of the Royalist newspaper, Soleil. Assouline refers in this context to Simenon's novel, Les Noces de Poitiers (1946), "one of his most autobiographical novels". Its hero, twenty-year-old Gerard Auvinet, is desperate to find work in order to help his family after his father's death. He becomes secretary to Jean Sabin, a great writer who is also president of the French Patriotic League. "... he had finally understood. The great novelist was living off the League" (quoted in Assouline, p51). It is not difficult to see the connections between Binet-Valmer and Sabin, Simenon and Auvinet, Paris-Centre and Soleil, and the Monsieur Gallet who tirelessly extracts subscriptions from Royalists under false pretences. I never thought I'd live to see the day that I'd be reading detective stories, but the detective element of Simenon's books is their weakest aspect, generally rather unconvincing. All the rest -- atmosphere, composition, narration, and characters -- is wonderful, at least for me. The detective part of his novels is not really good -- the crimes are the weakest and clumsiest aspect. But for atmosphere, character, intensity, humour, and above all for humanity and knowledge of the wretched, pathetic mass, adolescents in particular, he has no peer at all. (quoted in Assouline pp290-291). I feel this is true of Maigret Stonewalled. 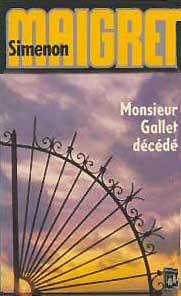 I find the means of suicide employed by "M. Gallet" contrived and implausible, even though Simenon has tried to prepare us by showing that the dead man was adept at making ingenious mechanical contrivances. But there is a great deal to enjoy in the book. I particularly like the depiction of the "parsimonious lovers", Henri Gallet and his mistress, Eleonore Boursang, with their businesslike relationship and their dream of saving enough over several years to enable them to move to the Midi. 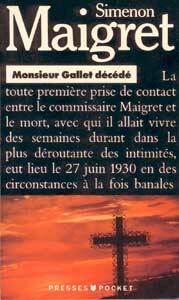 The description of Joseph Moers' patient and dedicated piecing together of the evidence is a delight, and as always it is a pleasure to be in the company of Chief Inspector Maigret as he experiences an uncomfortable train journey with the widow Gallet, gazes round Gallet's dreadful house, drinks a bottle of Sancerre (very quickly!) with St Hilaire, climbs walls (even though he weighs sixteen stone) and finally dispenses his own, essentially humane version of justice. Although there are many indications that this is an early, almost a prototype, Maigret, the essential qualities -- what Cowper Powys refers to above as atmosphere, character, intensity, humour, and above all ... humanity  are already present in abundance. Je pense qu'il s'agit de gare de l'avenue Foch située sur l'ancienne ligne de la Petite Ceinture, aujourd'hui utilisée par la ligne C du RER. Avant la réalisation du RER les quais n'étaient pas recouverts comme la station Port Royal sur la ligne B. Cette gare a reçu de nombreux trains spéciaux de souverains et présidents. 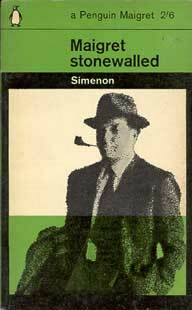 The Penguin paperback entitled Maigret Stonewalled was published in August 1963 with the translation by Margaret Marshall, which is close to Simenon's French text. This translation is a considerably better than the one by Anthony Abbot that was published in the United Kingdom by Hurst and Blackett Ltd. in January 1933, a few months after the American edition from Covici, Friede Inc. Both of these editions where published in hardback format with a dust wrapper. 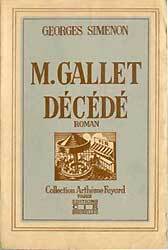 The American edition appeared with just the one novel The Death of Monsieur Gallet, whereas the British one was coupled with The Crime of Inspector Maigret (Le Pendu de Saint-Pholien). It is possible that someone at Penguin Books realised that the six Maigret novels published in 1933 and 1934 by Hurst and Blackett had somewhat idiosyncratic translations, so decided to commission new ones closer to the author's texts. These six Maigret novels from Penguin Books were only issued in paperback. During the spring and summer of 1930, Simenon, in his boat the Ostrogoth, had reached Morsang-sur-Seine (Seine-et-Marne), and decided to moor it further along the right bank of the river at a spot, in the district of Nandy, called Le Four à Chaux (as this translates as "lime kiln", it probably indicates what might have been there in the past). This place is too small to appear on the section of the map of the area posted, but it is located next to the "g" of Morsang where there are the crosses indicating the boundary. Simenon stayed there for some weeks where he probably wrote Pietr-le-Letton (The Strange Case of Peter the Lett / Maigret and the Enigmatic Lett)  his first Maigret under his own name  then Le Charretier de la "Providence" (The Crime at Lock 14 / Maigret Meets a Milord / Lock 14), Monsieur Gallet, décédé (The Death of Monsieur Gallet / Maigret Stonewalled), Le Passager du "Polarlys" (The Mystery of the Polarlys / Danger at Sea)  his first non-Maigret under his own name  and four novels under pseudonyms to fulfil his publishers' contracts. 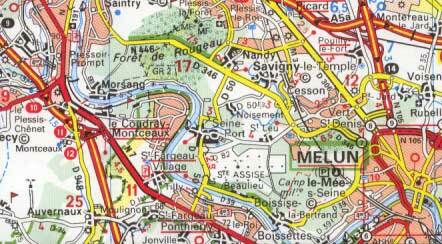 Map 1: a section of the river Seine, west of Melun (Seine-et-Marne), showing the locations of Morsang-sur-Seine and St. Fargeau-Ponthierry. Further up river there is located Saint Fargeau-Ponthierry (Seine et Marne) where Maigret goes to meet Madame Aurore Gallet, the wife of the dead man, so Simenon easily could have explored the area just before writing the novel. Only a few years before, the author was living for a while at the other main location in the novel. Simenon left Liège for Paris in the middle of December 1922, returning to the city of his birth the following March in order to marry Régine Renchon (whom he nicknamed Tigy). When he first arrived in Paris he worked for a journalist and writer Binet-Valmer, but then in June 1923 he was taken on as a secretary in the service of the Marquis Raymond d'Estutt de Tracy. The marquis had inherited a fortune and property from his father and Simenon was required to travel with him to his houses in various parts of France. One such property was the Château de Paray-le-Frésil (Allier), which Simenon later used as the setting for the Maigret novel L'Affaire Saint-Fiacre (The Saint-Fiacre Affair / Death of a Countess / Maigret Goes Home / Maigret on Home Ground), whilst another was the Château de Tracy (Nièvre) on the opposite bank of the river Loire to Sancerre (Cher). 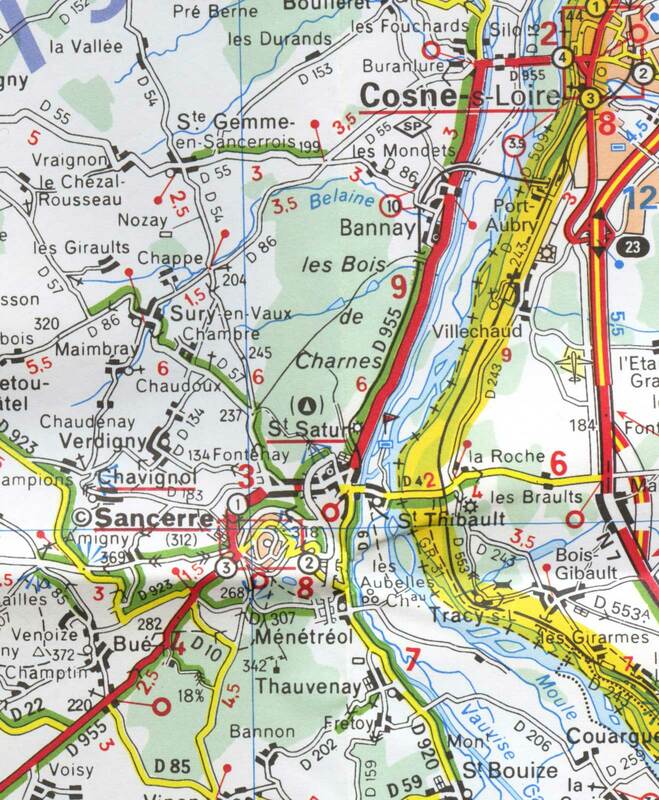 Map 2: a section of the river Loire, south of Cosne-sur-Loire (Nièvre), showing the locations of Tracy, St. Thibault and Sancerre. 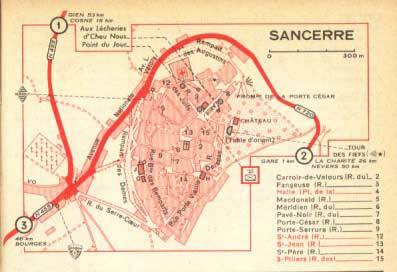 'It was seven o'clock in the evening when the train stopped at the station of Tracy-Sancerre and there was still over half a mile to do on the main road and then over the suspension bridge above the Loire. There was none of the magnificent grandeur of a great river here, only a scene of myriads of little streams running between banks of sand the colour of over-ripe corn. …The Hôtel de la Loire appeared, its yellow façade running along the embankment. Simenon describes the scene as it existed, but with certain understandable simplifications. There is Tracy station, not far from the Château de Tracy where Simenon stayed in 1923, with the road leading to the suspension bridge (apparently destroyed in 1940 at the beginning of the Occupation) over the river. Having crossed the bridge, there is the village of St.Thibault with the Quai Loire on which stands the hotel where the crime was committed. In reality this establishment was the Hôtel de l'Étoile, but Simenon renamed it the Hôtel de la Loire, most likely being cautious. 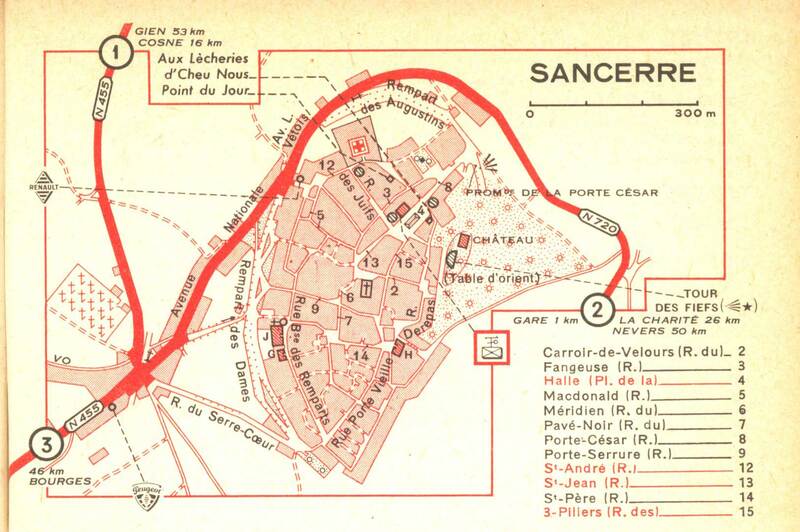 Map 3: Sancerre (c.1960). H indicates l'Hôtel de Ville (Town Hall), presumably where Monsieur Gallet's body was taken (Penguin edition, pages 13-16). At his interview with the marquis, Simenon said that he had only been married for two months, but his employer refused to allow Tigy to be with them, so where possible she would stay somewhere nearby. On this occasion she stayed at the Hôtel de l'Étoile in St. Thibault. But this was not the only time that Simenon associated himself with this hotel. In November 1937, he stayed there in order to write the novel Les Soeurs Lacroix, which is set in the town of Bayeux, in Normandy. Later this novel was translated into English under the title of Poisoned Relations. Jerome and Roddy both mention (02/05/04, 02/10/04) the first appearance of Joseph Moers, who works in the forensic laboratories attached to the Police Judiciaire in Paris. The surname, as mentioned, occurs from Simenon's early days. Affectionally known as "Vieux Papa", Guillaume Moors, or Moers, (1823-1909) had a daughter Marie Catherine Moors, or Moers, (1850-1905) who married Christiaan (Chrétien) Simenon (1841-1927), who was the author's grandfather. Both French and Flemish spellings of the surname seems to be frequently used. Georges Simenon's journalist friend Henri-J. Moers, who worked for the rival newspaper, La Meuse, not only introduced Simenon to the group of former students who called themselves La Caque, but co-operated in 1921 or 1922 with the novel Le Bouton de col (The Collar Stud). Simenon and Moers wrote alternate chapters of the novel, which was intended as a parody of the detective novel. Years later, Simenon, on reading the unpublished text, described the work as bad, and although the manuscript is in the archive, it is unlikely to be published. Some years ago I bought this set, which was available from several bookshops in the United Kingdom. There are nine books in the Simenon set, each containing two novels as Bob Kerr has stated. At that time these were easily obtainable, along with sets devoted to other authors. As mentioned, when Simenon was working for the Marquis de Tracy in 1923 and at the Château de Paray-le-Frésil (Allier), the steward's name was Pierre Tardivon. He used this surname in four novels, two written under pseudonyms and two under his own name. Joseph Tardivon in Les Larmes avant le bonheur (Tears before Happiness), 1924, as by Georges Simm. Tardivon in Nox l'insaisissable (The elusive Nox), 1926, as by Chistian Brulls. Nox, a thief, uses Tardivon as one of his other names. Tardivon is the name of the manager of the Hôtel de la Loire in Monsieur Gallet, décédé, 1932, by Georges Simenon. Tardivon is the name of a female factory worker in the non-Maigret novel Une Vie comme neuve (A New lease of Life), 1951, by Georges Simenon. In the Maigret novel L'Affaire Saint-Fiacre (The Saint-Fiacre Affair), 1932, the steward's surname is Gautier, whilst in the Memoires de Maigret, 1951, Maigret just states that his father was steward to the chateau.  Tu as l'air de revenir d'un enterrement! remarqua Mme Maigret quand il pénétra dans son logement du boulevard Richard-Lenoir… Tu as mangé, au moins? The translator for the Penguin edition, Margaret Marshall, has followed Simenon's text closely.